The U.S. Constitution famously prohibits any religious test or requirement for public office. 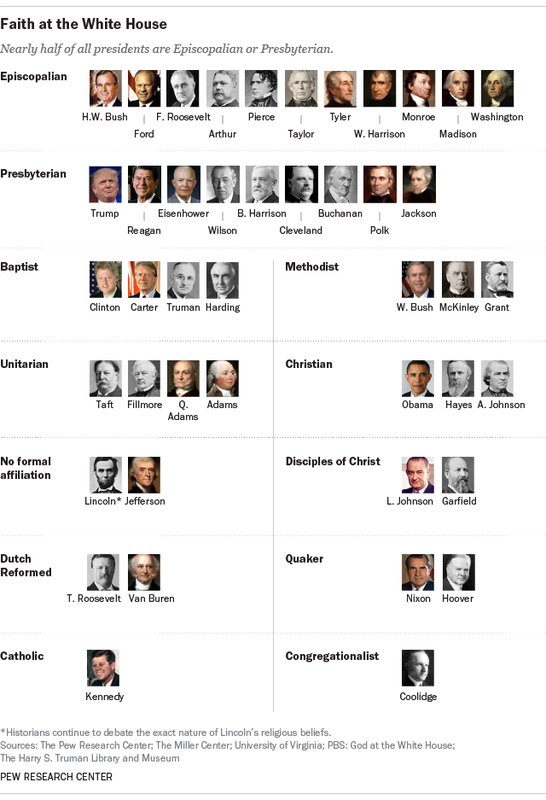 Still, almost all of the nation’s presidents have been Christians and many have been Episcopalians or Presbyterians, with most of the rest belonging to other prominent Protestant denominations. A recent survey by the Pew Research Center shows that many Americans care about their leaders’ faith. For instance, half of all American adults say it’s important for a president to share their religious beliefs. And more people now say there is “too little” religious discussion by their political leaders (40%) than say there is “too much” (27%). Trump’s predecessor, Barack Obama, was raised in a nonreligious household but converted to Christianity as an adult and worshipped at a United Church of Christ congregation – Trinity United Church of Christ – in Chicago. However, Obama left Trinity during his first presidential campaign in 2008 after controversial statements by the church’s senior pastor, Jeremiah Wright, gained widespread attention. Today, Obama calls himself a Christian, but is not a regular churchgoer. Note: This post was originally published on Feb. 12, 2015, and has been updated.